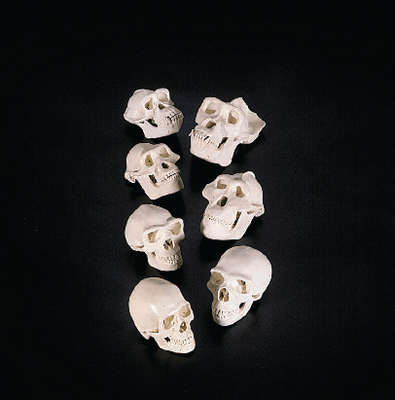 1:2 scale casts of 7 primate skulls provide an overview of speciation and evolution. These wonderfully detailed miniatures were sculpted by Steve Wagner. The set includes Australopithecus afarensis, Australopithecus boisei, Homo erectus, Homo neanderthalensis, a gorilla, a chimpanzee, and a modern human. Portable, durable and precise, this is a great set for quick and easy primate and hominid comparison. Each skull comes with its own identification card, attached by a cord, as well as additional printed reference material. Display Stand : An attractive way to display your replicas in the classroom, this heavy molded base supports all seven skulls in the series.